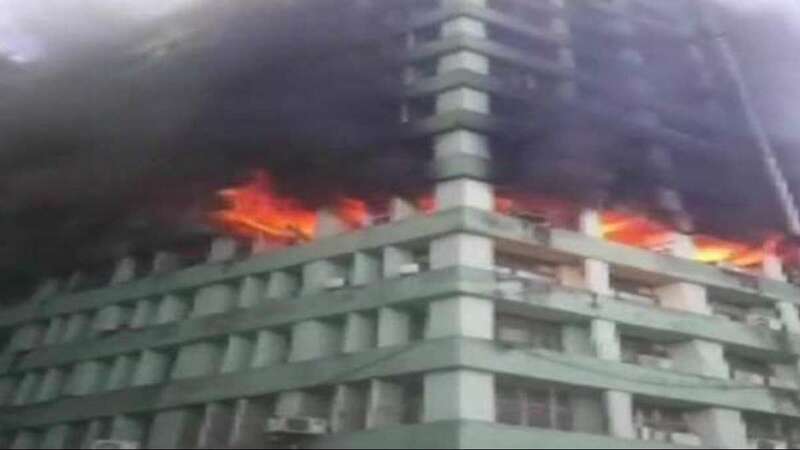 New Delhi : A sudden massive fire that broke out on the 5th floor of Pandit Deendayal Antyodaya Bhawan at CGO Complex in New Delhi has killed CISF personnel. A security personnel was taken to hospital after inhaling the smoke. 25 fire engines were sent to the location near the busy Lodhi Road and the Barapullah flyover. According to source, the Fire Department received a call at about 8.34 am, following which 25 fire tenders were rushed to the site. New injury or loss of life has been reported so far. The fire reportedly originated at the office of Ministry of Social Justice and Empowerment in Pandit Deendayal Antyodaya Bhawan, at CGO Complex. The Central Industrial Security Force (CISF) sub-inspector fell unconscious after inhaling the smoke and was taken to the All India Institutes of Medical Sciences (AIIMS). Many government offices, including a branch of the Indian Air Force, Water and Sanitation Ministry, Forest Ministry and the National Disaster Response Force (NDRF), are housed in the Antyodaya Bhawan in the CGO complex. "There was a fire inside an AC unit vent. We made a call, but the fire tenders took time to reach the venue," an eye witness told media. Further update from the fire department and accident spot is expected soon. Till then, stay tuned with us.